Virginia Tech beat Marshall 42-20 to extend its nation leading bowl streak to 26-straight. 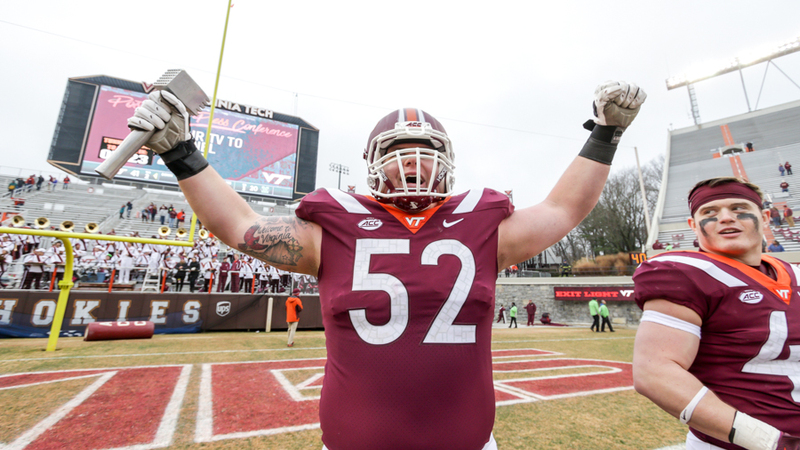 After the win, the Hokies serenaded the Lane Stadium crowd with a rendition of Tech Triumph. Geez, I really hope Tech can win the ACC before Dax leaves VT. I love Dax more and more each week. He's that friend you had growing up that whenever you would go out and play, would always end up covered in dirt with a handful of bugs and go home with the biggest smile on his face. He has one of the most infectious attitudes and I really can't wait to see what he morphs into over the next few years. This team has definitely caused some of the Hokie faithful to pull out their hair this season but beating UVA and making a bowl has definitely put a salve over the open wound we all felt from losing 4 straight in the ACC. I'm glad Fuente doesn't have to deal with hot seat talks all off season now. He's our coach and doesn't deserve that. He's done an amazing job given the hand he was dealt. Win or lose the bowl game, I'm proud of these kids and I know they will come back next year stronger, faster, smarter and I think we'll see a return to the true VT form that we know and love. I believe we took our lumps this year; next season will look a lot different. I think we do need to sure up a few areas with juco talent during the offseason but hopefully the voids start getting filled with regular recruiting. it wont be for lack of effort if we don't secure up those spots. they've been busting their A$$ to try and get JUCO dline guess. The bowl streak is extended past 25! ESPN gave VT less than a 4% chance of beating the Whoo's when VT had the ball at their own 25 yard line and Ramdo pulled down the miracle catch of the 50/50 ball. VT was at UVA's 25 yard line in OT when our kicker hit a 43 yard field goal to keep the streak alive! 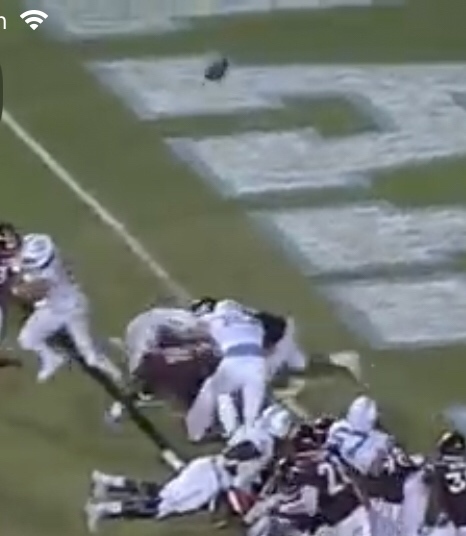 The UNC fumble popped exactly 25 feet in the air! Glad to see the Wyatt Teller meat tenderizer is still a thing. Offense's take on the lunch pail, perhaps? I didn't realize that Dax's hair was that long. I'd call him Sunshine if it weren't cultural for us to call him Moonshine. I think this video is demonstrative of what Fuente is trying to build and the culture he is trying to foster. This was a REALLY hard year. These guys look like a team. They are enjoying each others company. This is really good stuff. Dax is the kind of standout you want on the team because he makes the team stronger. I'm looking forward to seeing them play in this bowl. It's going to be tough but every week both units begin to understand it takes 11 guys on each side of the ball to play good football. I showed this to my 3 year old. Big mistake. Just watched it 4 times in a row, then the entrance from the Clemson game last year, and then this video one more time. Then I told her we ran out of plays. Not sure how I came across this, but it's pure gold.